Ian Dodd has pursued photography as a medium of personal expression for over fifty years. This has remained a private, more than a public expression. Dodd's work is well known in photographic circles and deserves to be shared more widely. Trained as an artist, Dodd has worked as an art director, a freelance illustrator and a cartoonist. In 1974 he was represented in the inaugural exhibition at the Australian Centre for Photography. This was followed by his first solo show in 1977. Dodd's photographic vision emerges from a belief, held strongly in the 60's and 70's, in photography's ability to express an essential inner world. Dodd sees things that most would only acknowledge subconsciously. Employing a visual equivalent of magic realism, he chooses film rather than words, as his medium of expression. In this exhibition, MYTHIC, Dodd presents a selection of black and white images of the natural and manmade world taken during his travels overseas and in Australia. They represent the strand of his photography that explores transformation, magic and mysterious realms. In selecting this work Dodd says he has always been fascinated with the fantastic in art and literature. Drawing upon documentary yet working in the realm of surrealism, Dodd creates evocative images and presents them as objects for contemplation. While his images appear simple, they consistently provide multiple levels for thought and appreciation. 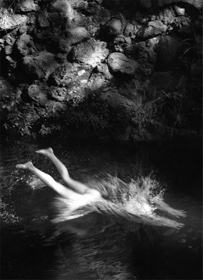 This exhibition coincides with the release of the book, Contemporary Photographers: Australia. Ian Dodd, published by Writelight. The series showcases the work of some of Australia's best known photographers including Lewis Morley, Wolfgang Sievers, Graham McCarter and David Moore. Ian Dodd has exhibited in numerous group exhibitions since the 70's. His photographic works are held in the collections of The National Gallery of Australia, Art Gallery of New South Wales, State Library of New South Wales and the Philip Morris Collection.